Festival Passes (both days passes) are also available for INR 900 and INR 600 for centre and side rows respectively. Contemporary dance challenges the structural rigidity of traditional dance forms, applying a critical understanding that allows dancers to combine the many languages of dance and speak to each other with a sense of fluidity and versatility. 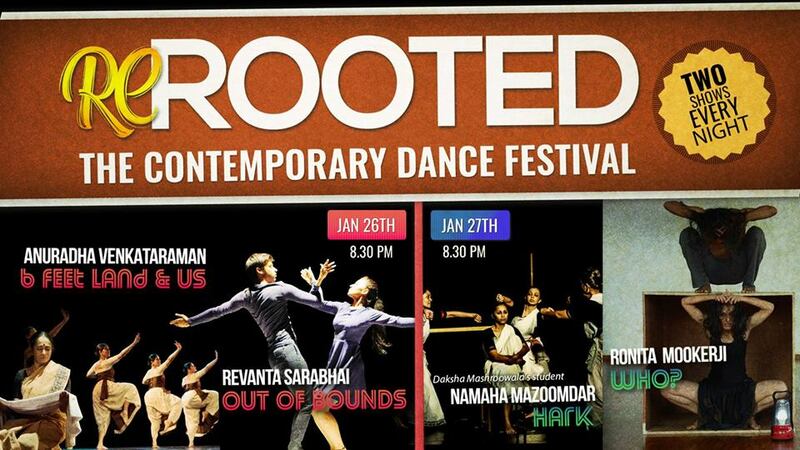 Re-Rooted: The Contemporary Dance Festival celebrates this very essence and the four groups performing here will represent a spectrum of Indian Contemporary work with roots in Bharatanatyam and Odissi. This festival is set between 26 and 27 January 2019 and each evening will play host to two dance performances from across India. 8:30 – 9:30 PM – Anuradha Venkatraman’s “Six Feet” Land & Us is a Bharatanatyam production that explores the relationship that humans share with land; provoking us to ask the question: how do we as humans strike a balance between ‘sustainability’ and ‘development’. 9:30 – 10:30 PM – Revanta Sarabhai’s Out of Bounds poses the question to the viewers and itself: what happens when you dissect Bharatanatyam to its core? As the dancers tread deeper towards an understanding of the dance form, their story evolves to reveal a parenthetical story about human relationships. 8:30 – 9:30 PM – Hark is presented by Kaishiki, students of Daksha Mashruwala, Mumbai. Namaha Mazoomdar’s HARK is a dance-theatre production based on a tragic real-life event of four happily married women in a family, turning widows within a year. crises through two interwoven solos, while trying to deal with the ‘dual’ energies present in nature–of the masculine and feminine. *GATES CLOSE AT 8:35 PM SHARP!